Before & Afters... want to send me a "before" to work on?? Well, it's definitely been more than a day or two, but when I posted Laura's session, I said I'd be back with before & afters, so here I am. 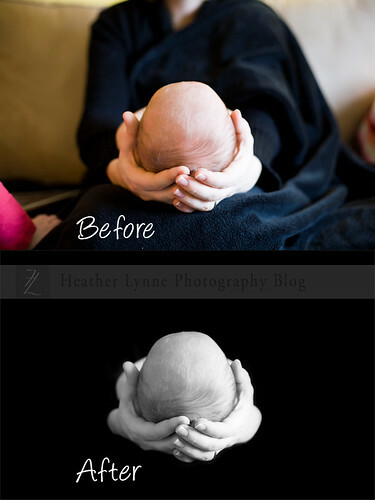 I do a lot of black background shots when I do a newborn session. 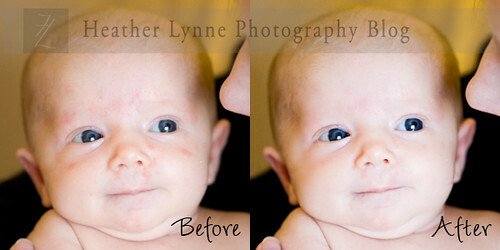 This is one reason why my baby shoots take extra Photoshop time. But I love the result! I really love playing with Photoshop and seeing what I can pull off. I also think it's a lot of fun to attempt to take some pounds off of someone in Photoshop & make it look realistic. This is one I don't get to play with as often. What fantastic photos. I always wondered how photographers got those black background shots. Now I know. Cool stuff!! Thanks for stopping by my blog! Yours is great too! So, are you LDS? I saw your post about listening to the Friend on-line (which I did not know you could BTW, so cool!) And just thought I'd ask!! Never mind, I just read you "about" page. LOL! Its so fun to run into other LDS moms through blogs! Fun! I love your blog and your photography! I have wedding photos that I want to photoshop, but I have never taken the time to learn enough about the program to do it. The photographer for my wedding didn't know how to use ps. Thanks for stopping by my blog! Your photography is beautiful! I like the popcorn idea too! You had me until the permission to post the before and after! LOL. Can you take the real life pounds off? I cam to say hello. Rhonda sent me. I think I'll be back, though! What an awesome talent. Love the pics. Thanks for the examples! I always love to see before and after shots. I love the BW image! !